This year’s PMRG Annual General Meeting will be be held on Thursday 1 March 2018. The meeting will begin at 6pm, in Arts Lecture Room 5 (G.61, ground floor, Arts Building), UWA. The meeting will be followed, at approximately 6.30pm, by the 2018 AGM Lecture. This is a free event, to which all are welcome. RSVPs are not required. The Florentine festival of 1539 has long been noted by scholars as an occasion of historical importance and prestige for the alliance it forged between the Houses of Medici and Habsburg. The musical, architectural and visual programmes for the festival have been understood to be representative of an overt political agenda, bolstering Tuscan and international relations. However, this talk reveals that reevaluating the place of emotions in musical theory and practice can enrich our understanding of the intricate relationship between music, magic and the affective practice of performing meraviglia on the early modern stage. To illustrate this relationship, the talk will draw upon a number of musico-theatrical interludes (composed by Francesco Corteccia and staged by Giovan Battista Strozzi) performed at the Palazzo Medici on 9 July 1539. Jennifer Halton is a researcher and curator with a diverse interest in collaboration across academia and the arts. She holds a PhD in Musicology from Maynooth University, Ireland, funded by the Irish Research Council. 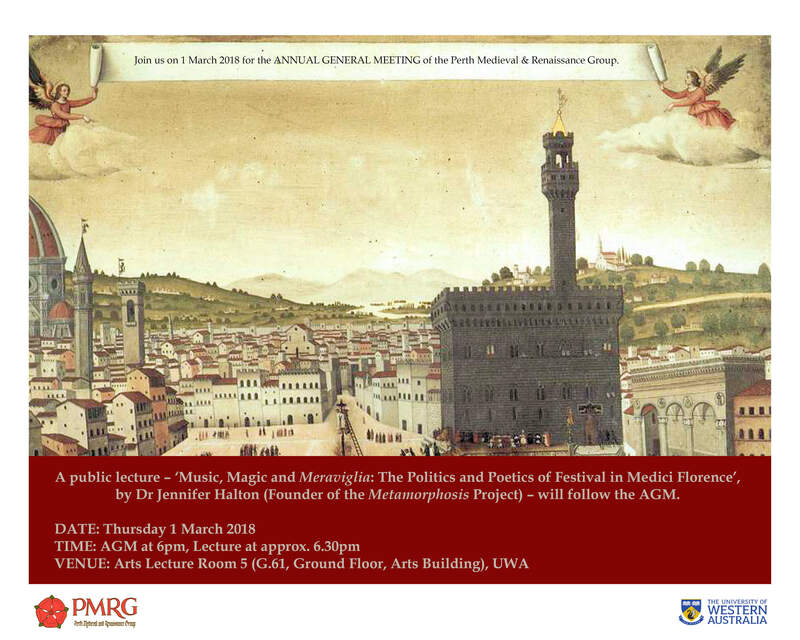 Her PhD thesis, ‘Mapping the Cine-Metropolis: Redefining Festival in Early Modern Florence’ is an interdisciplinary study of the phenomenology of music and space in sixteenth-century Florence. Taking the cultural practice of festivals as a conduit for analysing the relationship between people, place and identity, her research is framed by a methodology grounded in architectural, cultural and film theory. She is the founder of the Metamorphosis Project, an award-winning collaborative of academics and artists in Ireland, and has worked as a guest and educational curator with the Irish Architecture Foundation and the Illuminations Gallery at Maynooth University.